We absolutely love spatchcocked chicken. Simply delicious made in the oven and on stove top (see recipe for Spatchcocking the Chicken) . In any event I hadn’t ever made it on the grill and I wanted to . It came out just perfect, just wish I had better photos. We started eating it before I could photograph so I kind of assembled it and snapped. Next time I will take better photos and add them because this will be a staple in our house. As you know we love spicy food but you don’t need to use crushed red pepper you can just season with salt , pepper and paprika, garlic powder whatever you’d like . This is how I did it and for those of you who do like it a little spicy this was perfect. It wasn’t really all that spicy at all just a hint of kick. You will ask your neighborhood butcher to please remove the backbone of your chicken unless you’re good with the kitchen shears and can take it out by yourself. I prefer having butcher do it . (see photo) Chicken will still be in one piece or you can have them cut it into two pieces, it doesn’t really matter which way. I kept it as one whole chicken. Ingredients couldn’t be simpler, I’m sure you have all ingredients but the chicken. 1 whole chicken with back-bone removed and flattened as much as possible, if you’d like you can have chicken cut into 2 halves. 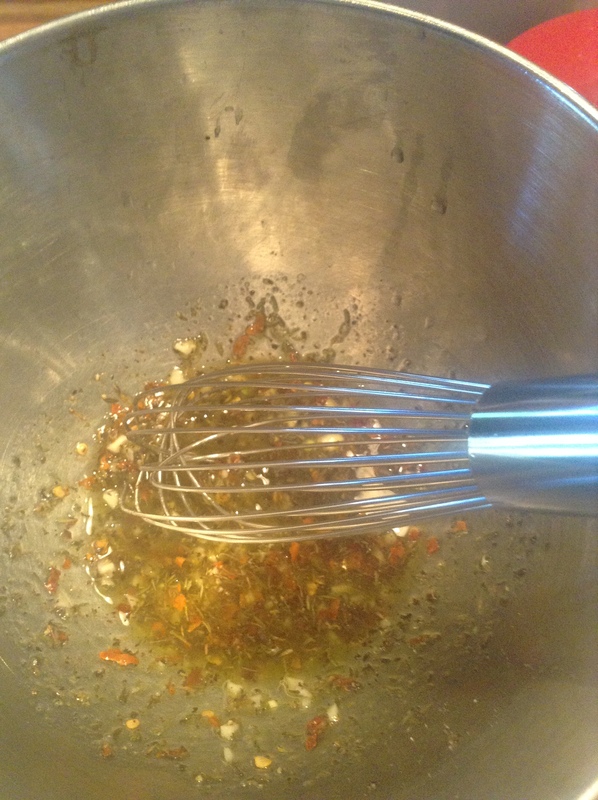 In a small bowl , add chopped garlic, chopped thyme along with lemon juice, oil, salt, red and black pepper. Whisk all ingredients together. Rinse the chicken and pat dry with paper towels. 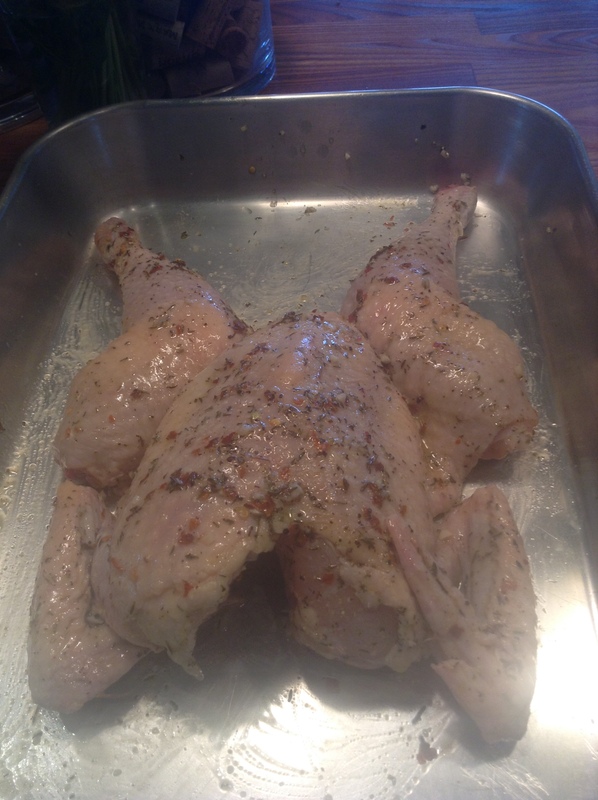 Put chicken on a baking tray and cover with marinade , I used a pastry brush to get marinade all over the chicken. Let chicken sit in marinade at least an hour and up to 24 hours. Heat the grill ( spray grill first with cooking spray or oil the grates). 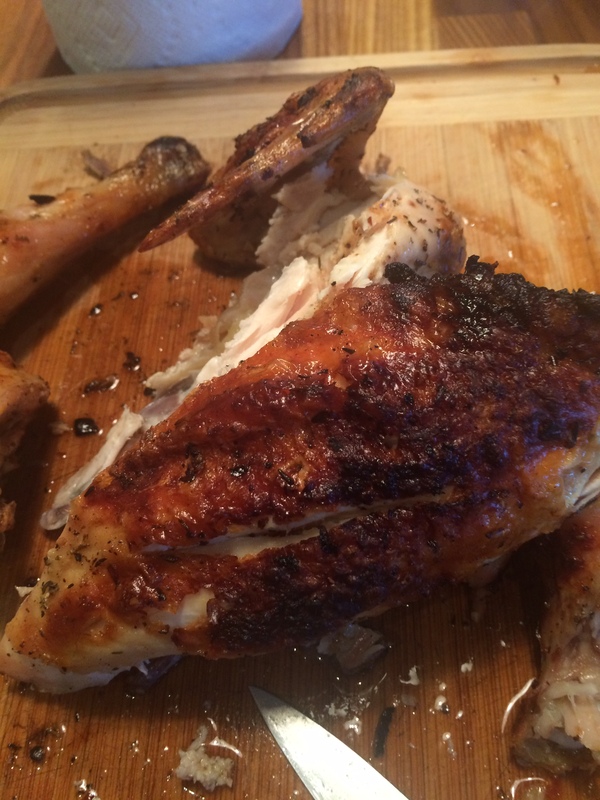 I turned heat on grill up all the way , once grill got very hot I turned it down to medium-low and placed the chicken on grill skin-side down, closed the cover and cooked it low and slow for about 22 minutes. You can check on chicken by lifting up with tongs , be sure to check up on it often to make sure you have no flare-ups with your grill. 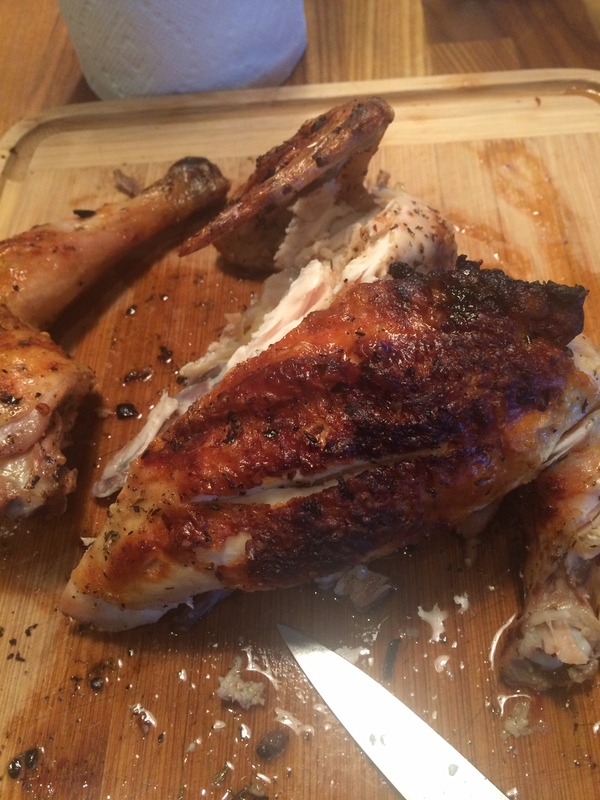 Flip chicken over and cook for another 20-25 minutes. You can cut into chicken to make sure it’s done. This method worked perfectly for me , as all grills are different you will have to see how long it will cook on yours. I did it 22 minutes per side and it seemed to work out perfectly. 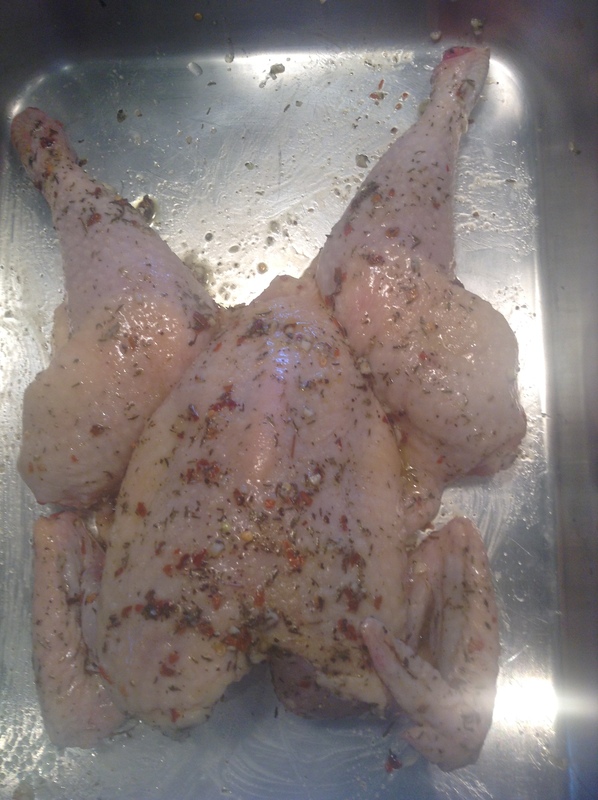 This entry was posted in chicken and tagged chicken on the grill, devils chicken, Spatchcocking the Chicken. Bookmark the permalink.